When Jumoke Hinton-Hodge was elected to the board of the Oakland Unified School District eight years ago, the district was emerging from state receivership after a $100 million bailout, the largest in California’s history. At the same time, enrollment in city schools was declining, the Great Recession was in full effect, and charter schools began to move into Oakland, promising to do a better job of serving the district’s mostly poor black and Latino student body. Helping charters gain their foothold in Oakland was Prop 39, a measure established in 2000 by California voters that strongly curtailed the ability of any governing body to turn away charter schools with credible proposals. “It was a perfect storm,” said Hinton-Hodge, a community- and youth-development consultant and pro-charter incumbent who is running for her third term against three challengers in the Nov. 8 election. 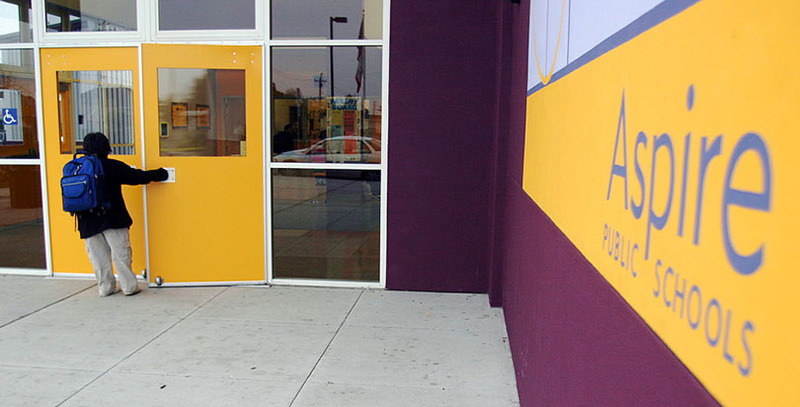 Charter schools continue to take root in Oakland. Today, nearly 25 percent of Oakland’s 49,052 public school students — 11,977 kids — attend one of the city’s 37 charter schools. Oakland is tied for 14th — with Albany, N.Y., and Inglewood, Calif. — for U.S. districts with the largest percentage of charter school students, but its percentage is far higher than in the U.S. overall (6 percent) and even in pro-charter California, where the statewide percentage is 8. But despite this long acquaintance with the charter school movement, Oakland’s continued investment in charter schools is fueling a highly contentious — and crowded — school board election. A total of 12 candidates are vying for the four-year terms this election cycle, with eight challengers running aggressive races against four incumbents. “This is one of the most important elections since I’ve been involved in the district, and I’ve been deeply involved for the last 16 years,” said Renia Webb, a long-time community advocate and parent of five children, all current students or graduates of Oakland district-run schools. The education issues being fought over in this Bay Area city with a long history of social activism — the successful growth of charter schools and how much of a seat those schools should be given at the table — are reflected in large urban districts across the country right now where the inherent tension between district and charter schools has become an open battle. How it plays out in Oakland and whose interests will be served could say much about where education reform is headed. In all, there are contested races in four of the seven voting districts on the November ballot, which could easily threaten the incumbent bloc that has formed among Hinton-Hodge, Jody London and James Harris. Many see this election as a referendum on the performance of the district’s superintendent, Antwan Wilson, who arrived from Denver two years ago. Wilson’s vision for the district embraces both charter and district-run schools, but critics believe elements of his reform agenda will lead to a dismantling of traditional public schools. Groups such as the teachers union are actively promoting candidates who have come out against Wilson himself or elements of his plans for the district. Notably, Torres is the sole incumbent not endorsed by the highly visible local school reform group Great Oakland (GO) Public Schools, which news reports tie to her opposition to a controversial common-enrollment proposal that would allow parents to easily choose between district-run schools and charters. Torres did not return a request for comment. Ash Solar, executive director of GO Public Schools, said the group’s “endorsement process is driven by the recommendations of parents, educators and community members evaluating school board candidates on a broad policy agenda, not a candidate’s willingness to support charter growth.” He said the organization did not back Torres because of her poor attendance record at board meetings, what it considers to be “the lowest bar” for a school board member. GO Public Schools endorsed challenger Huber Trenado, a teacher at an Oakland charter school, for the District 5 seat. The teachers union has endorsed Torres and a number of challengers: Macleay in District 1, both Wiginton and Lang in District 3, Hutchinson (along with Torres) in District 5 and Jackson in District 7. Candidates still have one more financial disclosure before the election, but according to Ballotpedia, as of Oct. 12, they’ve received a total of $86,487 and spent a total of $43,875. If the money paths clearly point to the most intensely competitive races, they are in Districts 5 and 7. In District 5, Torres’s opponent posted contributions of $16,003, versus her $12,420. The only other race as close in fundraising is in District 7, where Jackson, a charter school opponent, has raised $9,622 to Harris’ $11,836. Though the common-enrollment plan has been essentially shelved for now — critics say it would rapidly drain students from Oakland’s lower-performing district schools — it’s still very much part of the election cycle. One fact repeated often in the enrollment debate is that an outside pro-charter group funded $300,000 for initial research into the plan. The anti-charter group Parents United for Public Schools told reporters at the time it was a typical example of outside influencers pressing a national agenda in Oakland with very little input from local residents. For their side, proponents ask: How fair is a choice system when only the parents who are most talented at navigating byzantine bureaucracies can get the best possible outcomes for their kids? As it stands, the current enrollment process has few fans. Technically, parents in Oakland can select any city school, district or charter — but the reality of the process makes that excessively complicated. There are more than 35 separate applications and timelines during the lottery process. Siblings of enrolled students and those who live within neighborhood boundaries are given preference, which lowers the number of available seats for outsiders. And the system incentivizes the widespread practice of holding seats until parents receive word from all the schools on their list. One post for parents navigating Oakland’s enrollment process that was featured on a popular local blog, the Berkeley Parents Network, runs more than 30,000 words. Incumbent Jody London of District 1 said her North Oakland constituency would prefer her focus to remain on expanding district programs, not opening more charter schools. 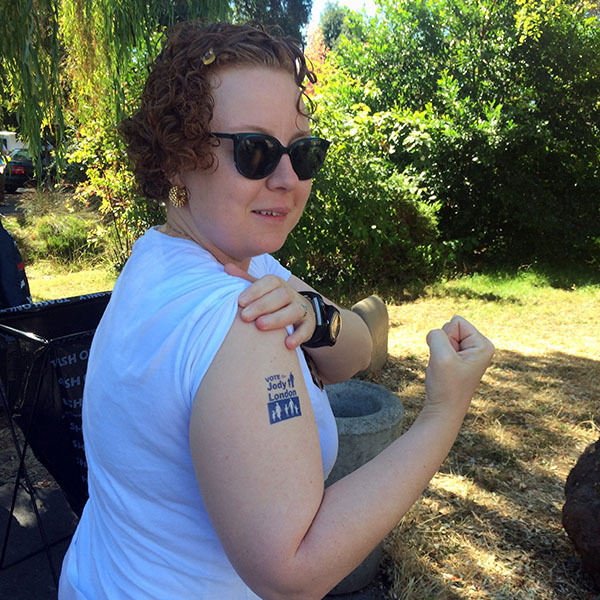 Campaigning at the Temescal Farmers’ Market in a rapidly gentrifying part of Oakland, a stack of “Vote for London” temporary tattoos at the ready — her daughter’s idea — London said Oakland simply has too many schools at this point. “I can’t be a good financial guardian when we operate twice as many schools as other districts of our size,” she said. Don Macleay, London’s opponent, has taken a stronger tack — calling for a full moratorium on charter schools, though his family chose one for their own child. He said his family had to look outside the district to find the bilingual Spanish program they wanted, but he added that he believes Oakland has the means to offer these types of programs within its own schools. “I just don’t see why this couldn’t be done within our local schools,” he said. Further fueling the schools debate in Oakland are the city’s surge in real estate prices and overall gentrification as more white and middle-class house hunters are getting priced out of the San Francisco market and turning to Oakland for its (relative) affordability and easy commute. The influx is making the competition for the most sought-after neighborhoods, and their schools, fiercer than ever. The value of a median-priced home in Oakland is now $626,500, up more than 12 percent from the year before, according to data compiled by Zillow. Still, it’s a bargain compared to San Francisco, where the median-priced home value is $1.1 million. The resurgence of interest in Oakland real estate is also rapidly changing the demographics in certain schools and neighborhoods. Peralta Elementary in North Oakland is one such school. In 2007–08, the student body was 24.11% white, 37.94% black and 4.35% Latino. It’s now 57% white, 16% black and 12% Latino. In addition to demographic shifts, enrollment in Oakland public schools, both district-run and charter, has begun to slowly increase after many years of decline. This is no small factor in a city where 17,000 children never set foot in any public school, district-run or charter. Charter schools are gaining students. City charter schools do not turn in their enrollment figures until Oct. 31, but the district shared statistics that showed that enrollment in charters increased by approximately 1,000 from last year. That includes the addition of Lodestar Charter School and KIPP’s expansion from 5–8 to K–8, as well as smaller increases at a few other schools. For Charles Cole III, a voter and district employee — his job is to engage more parents in Oakland schools — the charter-versus-district debate obscures what the board should be focusing on: how the district is serving its neediest families. He doesn’t have children in the district, but he’s a product of the Oakland Unified School District, and he said his history mirrored that of many struggling families in the city. His parents abused drugs. They moved often. His mother would have been exactly the type of parent who could not have navigated school choice or enrollment as it stands now. Choice under the current system for his family would have been no choice at all. Others share a similar view — that when it comes down to it, voters are looking for a system that supports their family’s educational goals. Dirk Tillotson is the founder and executive director of the nonprofit Great School Choices, which supports community-based charter school development. He also writes at Great School Voices and One Oakland United. “When around a quarter of kids attend charters and many families have children in both sectors [in Oakland], it’s pretty obvious that most parents don’t care about the distinction if they get a good school that treats them fairly,” Tillotson said. 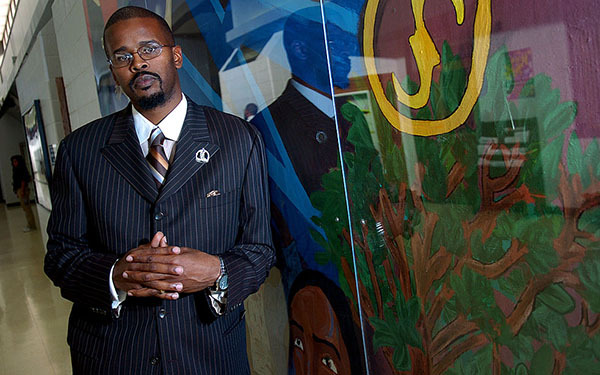 Wilson came to Oakland with sterling education reform credentials via The Broad Academy, which is funded by the Eli and Edythe Broad Foundation and trains school leaders looking to transform urban public schools. But Wilson’s public comments have largely stressed the need for district and charter schools to better assimilate. What is unfolding in Oakland is a “national model,” he said, a place where cradle-to-college programs are available for every student, supported by a “historic partnership between our city, our schools, our business community, philanthropists, nonprofits and others.” He mentioned the Oakland Promise, a college scholarship program that has the ambitious goal of tripling the number of Oakland students who graduate from college in the next decade. Webb, the mother of five, agreed that voters like her see the election as an opportunity to affirm recent gains in achievement within district-run schools, but they also want their votes to clearly register frustration that it’s not going faster. She has endorsed Hinton-Hodge, whose daughter attended a KIPP charter school in Oakland. A perfect example of the struggle parents face in Oakland can be found, Webb said, in her District 3 neighborhood school, Hoover Elementary. It is rated 1 out of a possible 10 by GreatSchools.org, a site popular with parents and real estate agents that relies solely on state test scores, and scored 705 out of a possible 1,000 on the California Academic Performance Index (API). So, like many other parents, she set her sights instead on one of the district’s more successful schools, Redwood Heights Elementary. By comparison, Redwood Heights rated a 7 out of 10, with an API score of 854. Getting a seat at Redwood Heights was possible, she said, because she has access to so many things her fellow West Oaklanders may not: transportation to get to a school outside the neighborhood, an awareness of how district enrollment works and, of course, her decades of experience as an advocate. In a district where everyone wants to get into the same four district elementary schools, Webb said, it’s easy to see why so many families can get left behind — and why charters become so attractive. Redwood Heights Elementary is so organized that a fleet of parent volunteers is on hand to take over mundane tasks for teachers so they can focus on lesson-planning. Webb’s experience trying to enroll her niece at Skyline High School — “No. 90 in a line that would make the DMV blush,” as she wrote last year in an op-ed in the San Francisco Chronicle — showed her that parents are still locked in a battle “for the same small group of schools,” which will always result in winners and losers. To her, the only thing candidates need to be talking about is how to bring up performance in as many schools as possible. “Save one [child] to leave behind 10? Hell no,” is how she put it. Regardless of news headlines or the number of campaign fliers stuffed in mailboxes, for most parents, it comes down to finding the right school for their child. So who is doing a better job, charters or district-run schools? The shortest and most correct answer is that it still depends on the individual school. The most recent test scores from the 2016 California Assessment of Student Performance and Progress (CAASPP) makes it difficult, if not impossible, to say who is doing a better job of educating Oakland’s youth. Each system has schools performing above and below state averages; taken as a whole, the district remains below state averages. Districtwide, 20 percent of students met or exceeded English standards and 25 percent met or exceeded math standards. The state average in California is 49 percent of students meeting or exceeding English standards and 37 percent meeting or exceeding standards in math. Only 2 in 10 students from low-income families in Oakland “attend schools that are closing the achievement gap,” according to the Education Equality Index, and that gap in Oakland grew faster than in 80 percent of other major U.S. cities, according to data from 2011–13. “Low-income” describes nearly three quarters of the district, where 74 percent of Oakland students qualify for a free or reduced-price school lunch, a common indicator of poverty. But the report also found 10 schools in Oakland that have proved their ability to prepare low-income students to achieve at levels that “match or even exceed their more advantaged peers.” Of the 10, seven are charter schools and three are district-run. Another key source of data for parents, board members and educators in Oakland has been the 2016 Public Education Progress Report, which for the first time includes data from both district-run and charter schools. It found that while district-run schools serve a higher proportion of special education students — 12 percent, versus 8 percent in charter schools — both charter and district-run schools serve other high-needs groups, such children living in poverty and those in foster care, at similar rates. The report also found that when it came to English performance among third- through fifth-graders, district-run schools had a higher percentage of students exceeding the standards and a slightly higher of those meeting them. 12 percent of students in district-run schools exceeded standards in English, versus 7 percent in charter schools. 17 percent of students in district-run schools met standards in English, versus 15 percent in charter schools. That advantage shifted most markedly when it came to middle school math scores, where charter schools achieved far better outcomes. According to the report, 19 percent of charter school seventh- and eighth-graders exceeded state math standards, compared with 7 percent of seventh- and eighth-graders in district-run schools. This report is unique in that it covers outcomes from pre-school to post-graduation. For example, a key marker for California high schoolers is whether they can graduate with the specific courses required to be considered for a spot at a “UC” — a University of California school — or a California state university. In charter schools, 93 percent of graduates had the required courses, versus 56 percent in district-run schools, the report said. Solar, the executive director of GO Public Schools, said Oakland students have made progress on several fronts, including a 5 percentage point increase in graduation rates and a 50 percent decrease in suspensions. "But we know too few kids are on track to succeed. The choices that we make in this election will determine if we are able to continue making progress and help students improve faster or turn back the clock," Solar said, saying GO supporters are working "to get out the word about the school board candidates they believe will ensure equity, justice and progress for their students." It’s not just parents noticing the differences between Oakland’s most successful public schools and its least. 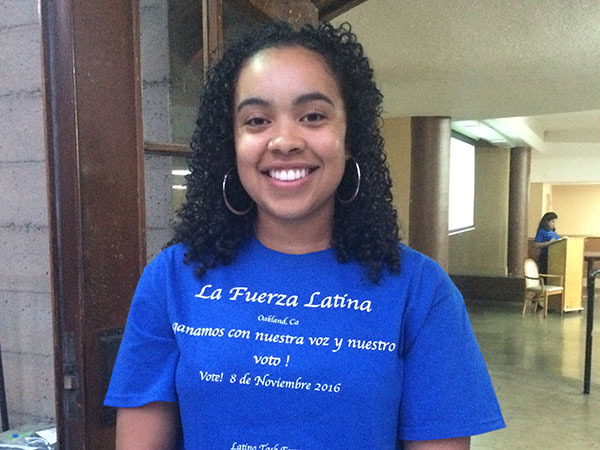 Speaking on Sept. 22 outside a Latino candidates’ forum at St. Jarlath’s Church, where she was volunteering, recent Oakland graduate Imani Curtis-Contreras said kids know when they are in substandard schools. She recalled one class in which her English teacher was present for only 10 days out of an entire academic year; substitutes taught all the rest. Then there was the time when representatives came to the more affluent and higher-achieving middle school, Montera, to prepare students for Advanced Placement classes in high school. At her school, the poorer Bret Harte Middle School, no one came, she said. Luckily, she said, her parents fought for her to gain access to challenging classes. She now holds a degree from San Jose State University (Class of 2015), where she studied athletic training. She hopes to pivot toward work in public health. She doesn’t feel cheated, she said, just “sad” that it can take so much effort to make the most of Oakland’s public schools. “There were always, like, three kids who never got any textbooks at all,” she said. 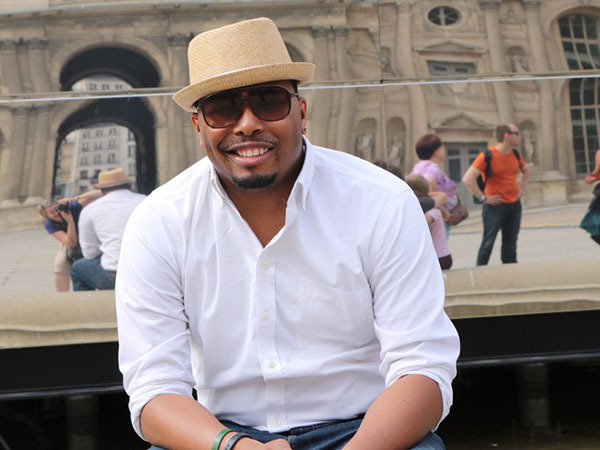 When voters go to the polls Nov. 8, Cole, the Oakland graduate and community engagement specialist, hopes they think of what’s best for all students. The Eli and Edythe Broad Foundation provides funding for The 74.